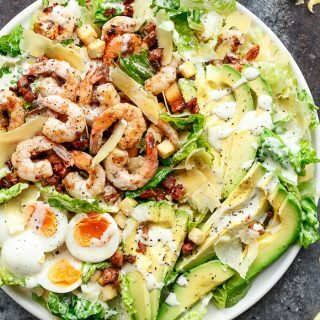 Grilled and Skinny Lemon Garlic Shrimp Caesar Salad with a lightened up creamy Caesar dressing is a complete meal in a salad and a family favorite! 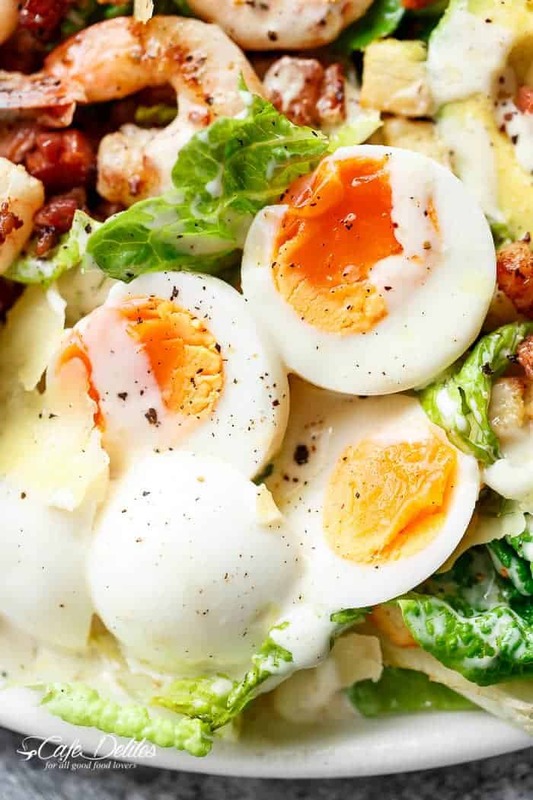 This twist to a classic caesar salad recipe is a fresh and healthy way to fill up your day! 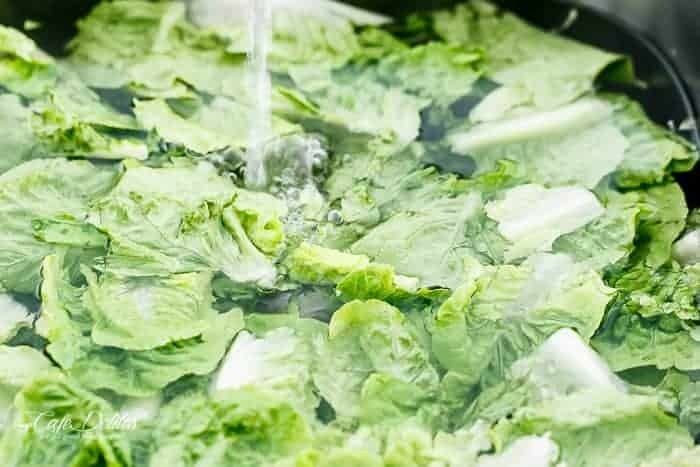 A refreshing and addictive salad that doesn’t leave you hungry and wanting more food, raiding the refrigerator at midnight. 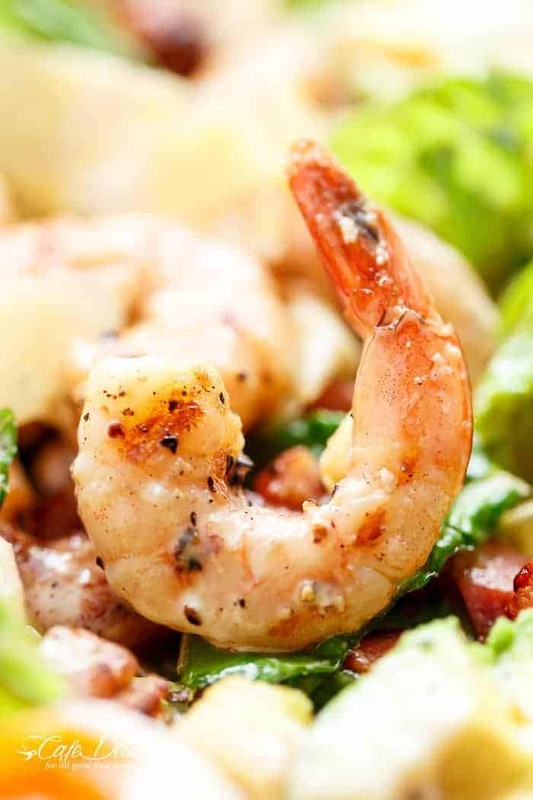 Full of protein thanks to the shrimp AND the creamy, lightened up dressing. With the added avocado slices, shaved parmesan cheese and crunchy croutons, this is another one of my filling ‘meal in a salad’ type of salads that promises to satisfy you without the fear of busting out of your jeans! First things first friends. 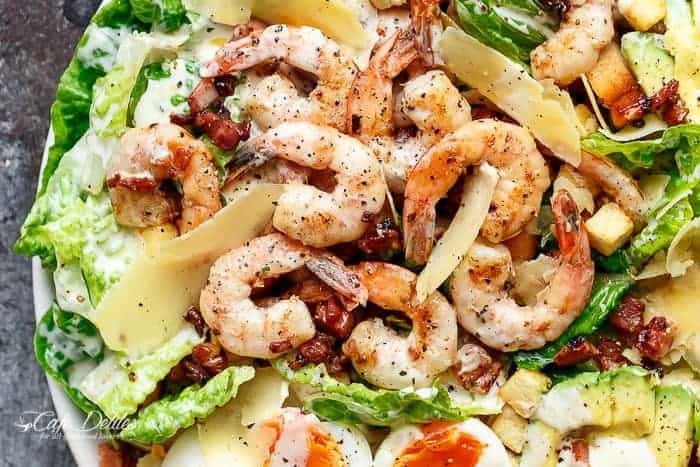 I make my own croutons for this Shrimp Caesar Salad, BUT you can use store bought croutons if that’s all you have or if you’re having a bad day and can’t be bothered making your own and need this salad in a hurry. I feel you. If making your own, start them first before touching the shrimp. 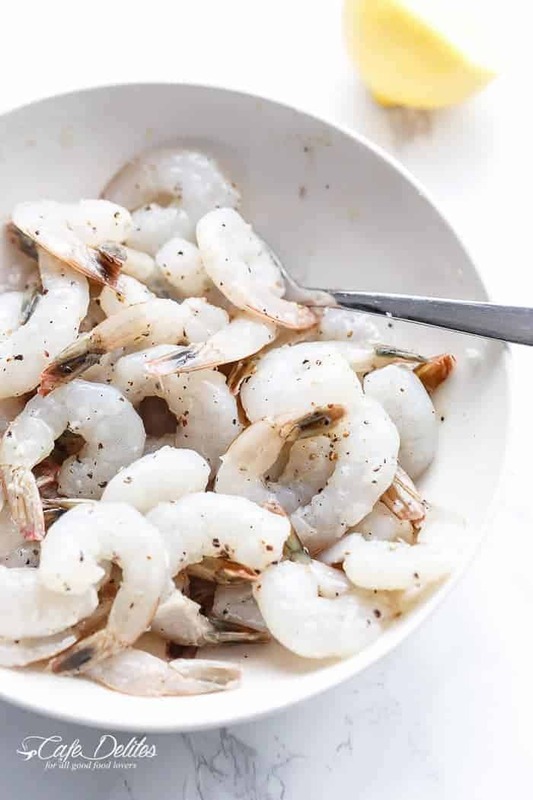 While they’re broiling (or grilling) in the oven, prepare your shrimp. We’re not using just ordinary shrimp here. You’re going to pimp your shrimp up with garlic and lemon and pepper and salt and FLAVOR. Then, you’re going to leave it to marinade a bit while you prepare your salad leaves and fry your bacon pieces. 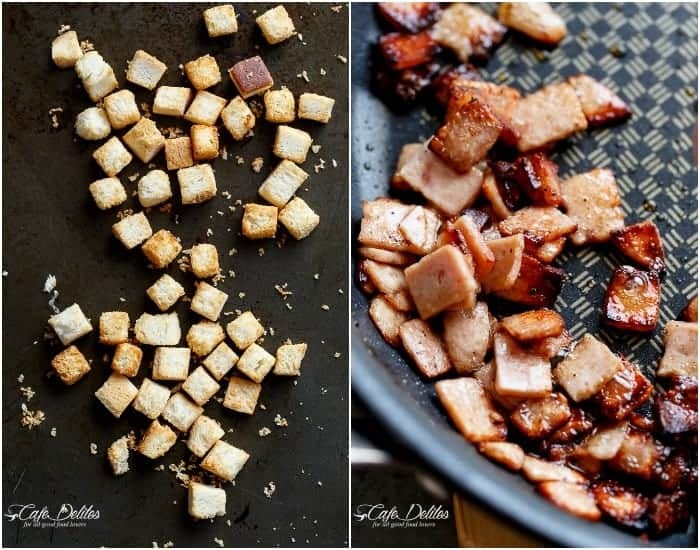 By this stage, your croutons should be just about ready. But don’t forget them…..like I may have in the past. There’s nothing like a burnt crouton. Next, you’re going to grill your shrimp in batches to make sure they get crispy with that incredible, bbq’d char grilled flavour. What I love the most is that the shrimp only takes MAXIMUM 5 minutes to cook per batch. Hello quick salad. Throw it all into your bowl with the parmesan cheese, avocados and sliced egg. Then drizzle over this lightened up homemade CREAMY caesar dressing that is healthier and better for you than normal caesar dressings or commercial store bought-dressings. And demolish it in less than 5 minutes like we do. If you’re looking for MORE Caesar Salad variations, how about this Salmon and Avocado Caesar Salad or Skinny Chicken and Avocado Caesar Salad! Char grilled and skinny lemon garlic shrimp Caesar salad with a lightened up creamy Caesar dressing! Easy to make with creamy avocado slices, crunchy croutons, shaved parmesan cheese, and a soft boiled egg! 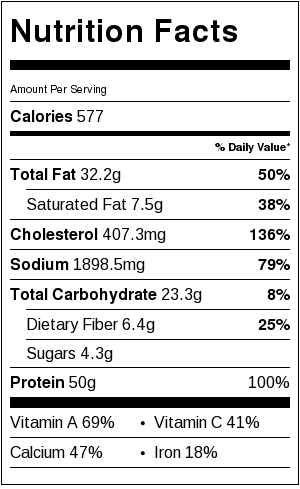 This recipe serves 2, and can be easily doubled to serve 4. Preheat the oven to grill/broil settings on medium - high heat. Place the cubed bread onto an oven tray; drizzle with olive oil (or spray with cooking oil spray) and bake in the oven (on middle shelf) until crispy. Alternatively, use store bought croutons. Combine the shrimp in a shallow bowl with the lemon juice, garlic, salt and pepper. Allow to marinade for 10 minutes or so while preparing your other ingredients. Heat a grill pan (or skillet or non stick pan) with a light drizzle of olive oil; fry the bacon until golden and crispy. Transfer to a warm plate; set aside. Drain some of the bacon fat from the pan, leaving about 1 teaspoon in the pan for the shrimp. Fry the shrimp for 2-3 minutes each side (be careful not to over cook or they will get rubbery!) Set aside. Combine the yogurt, mayo, oil, garlic, anchovies, lemon juice and parmesan in a magic bullet blender, small blender or a small food processor. Blend until well combined; add salt and pepper to your tastes, and blend again until smooth. Taste test. 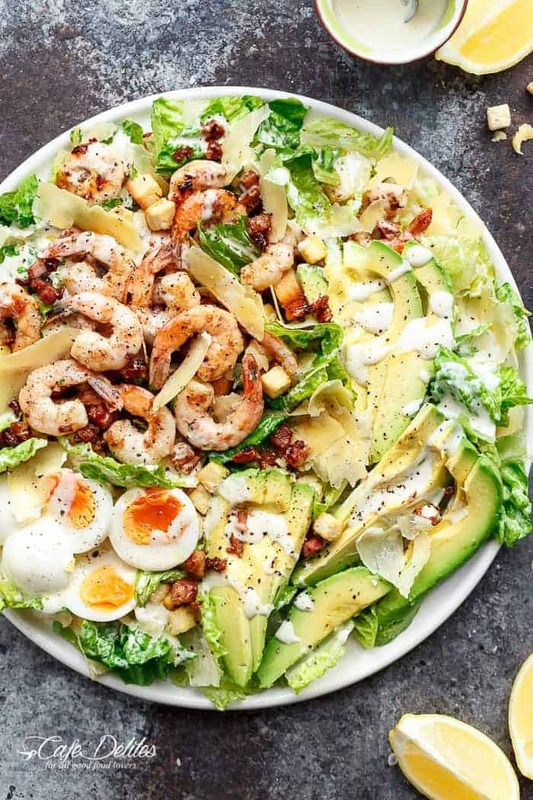 Combine the lettuce with the shrimp and bacon; avocado slices; shaved parmesan cheese; and croutons. Pour over the dressing; mix well to combine. Slice the egg and arrange on top. Great recipe! The dressing is really good. I added a touch more mayo but no oil and a dash of dried parsley. Will definitely use this dressing in the future. Looks so delicious. Will give it a try. You have the most delicious salads….makes salad days great! Pinned. Thanks for sharing!